Celebrate ninety years of motorsport excellence astride some of the most iconic bikes ever built. Milestone unveil some of the best-loved models joining the roster in Ride spin-off Ducati - 90th Anniversary. Immerse yourself in true motoring legend and relive almost a century of iconic engineering, dogged determination and boundless passion with this standalone spin-off from the development team behind RIDE and RIDE 2. Climb behind the handle bars of 39 classic Ducati motorcycles and race your way through ninety pioneering years at the top of the motorsports industry. Follow racing careers from the 1950’s and towards the present day, reliving breath-taking victories on five faithfully-reproduced country tracks and eight official race circuits. Between races you can also visit the Ducati Museum and a get a closer look at the engineering landmarks and championship victories that shaped the industry and the manufacturer over the course of a century. 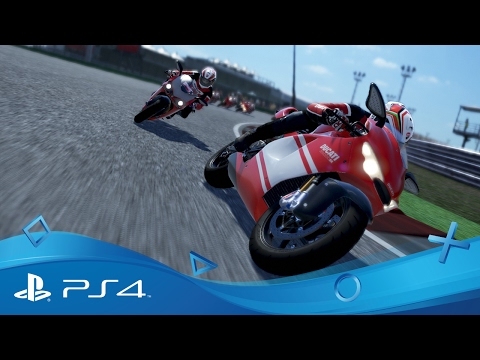 Burn rubber on two wheels with RIDE, the superbike motorcycle racer for PS4.